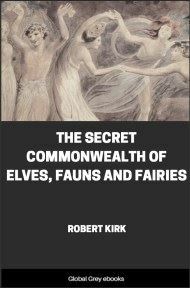 This two-volume work, published in 1901, had its beginnings in the late 1870s, when Rhys began collecting Welsh folk tales. 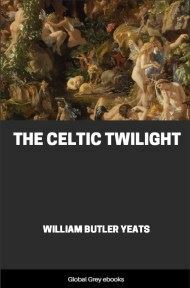 His entertaining preface sheds light on folklore fieldwork and its difficulties, including fragmentary evidence, alteration of stories by those interviewed, and the hostility of the religious and educational establishment to 'superstition'. 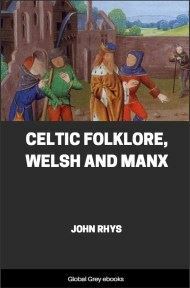 For each text, Rhys provides fascinating information about his sources, and an English translation. 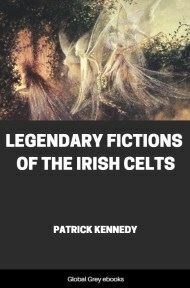 He analyses possible origins for the tales, in imagination and myth, and in early British history, and compares them with legends from elsewhere in the British Isles. THE chief object of this and several of the following chapters is to place on record all the matter I can find on the subject of Welsh lake legends: what I may have to say of them is merely by the way and sporadic, and I should feel well paid for my trouble if these contributions should stimulate others to communicate to the public bits of similar legends, which, possibly, still linger unrecorded among the mountains of Wales. 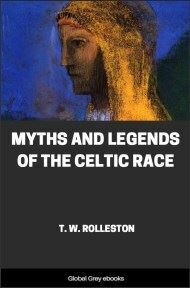 For it should be clearly understood that all such things bear on the history of the Welsh, as the history of no people can be said to have been written so long as its superstitions and beliefs in past times have not been studied; and those who may think that the legends here recorded are childish and frivolous, may rest assured that they bear on questions which could not themselves be called either childish or frivolous. So, however silly a legend may be thought, let him who knows such a legend communicate it to somebody who will place it on record; he will then probably find that it has more meaning and interest than he had anticipated. 'When the eventful struggle made by the Princes of South Wales to preserve the independence of their country was drawing to its close in the twelfth century, there lived at Blaensawdde near Llanddeusant, Carmarthenshire, a widowed woman, the relict of a farmer who had fallen in those disastrous troubles. 'The widow had an only son to bring up, but Providence smiled upon her, and despite her forlorn condition, her live stock had so increased in course of time, that she could not well depasture them upon her farm, so she sent a portion of her cattle to graze on the adjoining Black Mountain, and their most favourite place was near the small lake called Llyn y Fan Fach, on the north-western side of the Carmarthenshire Fans. 'The son grew up to manhood, and was generally sent by his mother to look after the cattle on the mountain. One day, in his peregrinations along the margin of the lake, to his great astonishment, he beheld, sitting on the unruffled surface of the water, a lady; one of the most beautiful creatures that mortal eyes ever beheld, her hair flowed gracefully in ringlets over her shoulders, the tresses of which she arranged with a comb, whilst the glassy surface of her watery couch served for the purpose of a mirror, reflecting back her own image. Suddenly she beheld the young man standing on the brink of the lake, with his eyes riveted on her, and unconsciously offering to herself the provision of barley bread and cheese with which he had been provided when he left his home. 'Bewildered by a feeling of love and admiration for the object before him, he continued to hold out his hand towards the lady, who imperceptibly glided near to him, but gently refused the offer of his provisions.